Description: Part of the 32X Arcade Classics series. Box Text: The F-14 Thundercat. It's the fastest, meanest set of wings ever to slice through the air. And you're flying it! The action in this supercharged game is so intense, the graphics so real, you'll sweat bullets as bogeys fill the skies. Get vertigo from going vertical. The rush you feel is from pulling heavy G's as you try to evade lightning fast missiles and tracers. Feel your adrenaline pumping as your radar locks onto multiple targets and your Sidewinders blow them out of the sky. 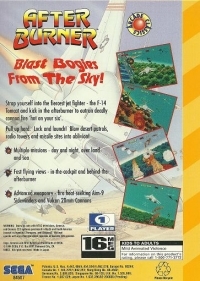 When you feel the need for speed, go supersonic with After Burner! 10-28-2012 exonerator Description Part of the 32X Arcade Classics series. 10-12-2012 exonerator Box Text The F-14 Thundercat. It's the fastest, meanest set of wings ever to slice through the air. And you're flying it! The action in this supercharged game is so intense, the graphics so real, you'll sweat bullets as bogeys fill the skies. Get vertigo from going vertical. The rush you feel is from pulling heavy G's as you try to evade lightning fast missiles and tracers. Feel your adrenaline pumping as your radar locks onto multiple targets and your Sidewinders blow them out of the sky. 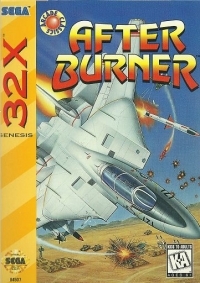 When you feel the need for speed, go supersonic with After Burner!